One of the small pleasures of my job is snooping on others. Well, maybe that’s a little extreme, but I do enjoy examining how Americans spend their free time and money. For instance, did you know that the pet market has been strong during this recession? Why? Well to quote a recent Mintel report, “Difficult, stressful times put a premium on the unconditional love and nurturing that pets bestow upon their owners.” So, when students ask about consumer trends or lifestyles, one of the first places I look is Mintel which provides coverage for the US as well as the UK and Europe. 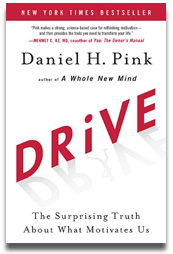 Pink, Daniel H. Drive : the surprising truth about what motivates us. Riverhead Books, 2009. Several years ago, in A Whole New Mind, Daniel Pink argued that American professions have been dominated by analytical thinkers, but soon these left-brained MBA number crunchers would be replaced by a different kind of worker, the right-brained designer, storyteller and big picture thinker. These new workers would offer a new skill set to their employers — creativity, empathy, joyfulness and meaning. In his new book, Drive, Pink picks up the related theme of motivation. He argues that the incentive plans used by most organizations do not work. Even worse, there is scientific evidence that money acts as a de-motivator. Pink advises managers to pay people fairly and adequately to take money off the table, but he shows that the most effective reward is intrinsic — performance of the task itself. Pink describes successful people as hard working and persistent. They possess an internal desire to control their lives, to learn about their world and to accomplish something that endures. They work hard to grow and develop, and to connect to a larger purpose. These workers have higher self-esteem and better interpersonal relationships than those who are extrinsically motivated. Every organization needs to retain and cultivate these creative, problem-solving, big picture people. This book presents interesting ideas but the treatment is rather surface. In the final pages is a chapter summary, a cocktail party summary, plus a Twitter summary, “Carrots & sticks are so last century”. Drive says for 21st century work, we need to upgrade to autonomy, mastery & purpose. Datar, Srikant M. et al. 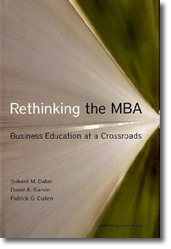 Rethinking the MBA : business education at a crossroads. Harvard Business Press, 2010. When I earned an MBA several decades ago, the degree was considered a passport for many jobs, particularly in consulting and finance. When leading firms wanted to adopt new business insights and analytical skills, they would hire MBAs from top schools. But today, according to a new book from Harvard Business Press, some employers are questioning the value of MBA degrees, and students are bypassing the traditional two-year daytime MBA in increasing numbers in favor of alternatives including executive, one-year, or part-time MBA programs, as well as in-house company programs. In Rethinking the MBA, authors Datar, Garvin and Cullen analyzed the programs at top MBA granting institutions, and found that overall, the schools are strong in training students to perform analysis. Today’s changing world economy, however, reflects a growing need for more effective leaders and entrepreneurs. Business schools, the authors assert, need to teach students the values, attitudes and beliefs that form managers’ worldviews, and to develop key management skills, such as how to build group consensus, or to negotiate through the power politics of large organizations. Looking across MBA programs, the authors identify eight needs that are poorly addressed by business schools today. Several of them are at the heart of teaching at the Fuqua School, including gaining a global perspective; developing leadership skills; and thinking critically and clearly. Calling for a re-balancing of the curriculum in favor of guided practice and self understanding, the authors recommend use of cases over lectures, and describe new pedagogies, such as reflective exercises and experiential learning.